John J. Duffy’s study of Marsh reinforces Wells’ theological study of Transcendentalism independently, while giving a decent biography of James Marsh, as well as a look at his thought and how Aids to Reflection contributed to American Transcendentalism, including much of Marsh’s personal correspondence. Spiller acknowledges Aids to Reflection briefly as a “secondary source” for the movement, again as a prelude explaining Emerson’s understanding of Reason and Understanding in terms of his own religious experience rather than in terms of a national religious experience. 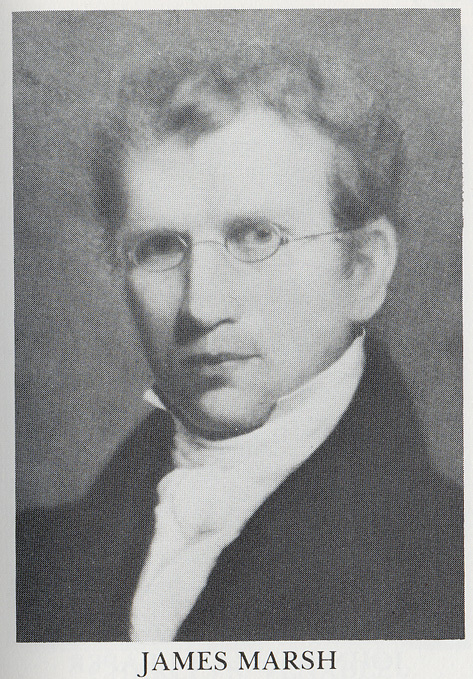 In 1982 Peter Carafiol, Fulbright-Hays Professor of American Literature at the University of Regensburg in Germany, came out with a book dealing solely with James Marsh and Aids to Reflection entitled Transcendent Reason: James Marsh and the Forms of Romantic Thought which gives a thorough background in how religion and the philosophical thought of Coleridge caused Marsh to print the American edition of Aids to Reflection, discusses how the Transcendentalist movement began in Vermont, and not Concord or Boston. The 1989 edition of The Norton Anthology of American Literature, Vol. 1, 3rd Edition, leaves out Marsh, while giving a nod to Coleridge’s Aids to Reflection in terms of Emerson’s own faith, and his own understanding of Reason and Understanding, and also discusses in an abbreviated fashion the religious temperament of Boston, mentions William Ellery Channing as a leader of Boston Unitarianism, but includes none of Channing’s writings, nor any excerpted material from Aids to Reflection; the four sentence background is again only a prelude to the literature of Emerson. The Heath Anthology of American Literature, Vol. 1 (1998) does not discuss Transcendentalism in terms of Marsh, Coleridge, or religion at all, but discusses the movement in terms of “the revolutionary impulses of Romanticism, with its emphasis on openness to nature and feeling, its idea of grand individual selves set free–or at least capable of being set free–from the constraints of tradition and decorum, with its view of society as a set of illegitimate constraints on free development of the self” (1561-62). While this description is not entirely wrong, it is certainly incomplete. The most recent anthology, The American Tradition in Literature, (2007) gives an excellent discussion of Transcendentalism in terms of religious and social change in New England, discussing the movement in terms of “a fertile conjoining of New England Unitarianism and romanticism” (865), but does not mention Marsh or Coleridge’s Aids to Reflection at all, not even in terms of Emerson’s thought. The questions that come to mind immediately is given what academia knows about Marsh, Coleridge and the contribution of Aids to Reflection, given that academics such as Matthiessen, Carafiol and Duffy have acknowledged that the movement began in Vermont, and not Boston or Concord, why there are such gaps of knowledge in the sections of the anthologies given over to Transcendentalism which are the foundation of undergraduate English survey courses; secondary to this question is why as the years progress in our examination of the above anthologies and academic works, why Coleridge and Marsh gradually drop out of the discussion altogether. All of the anthologies give the impression that Transcendentalism began in Boston/Concord, and seem very selective as to whether to bring anything of the religious background of the movement into the discussion or not. In other words, what students learn is completely at the mercy of the English department in the texts it selects for its survey courses. Due to the fast pace which survey courses tend to be subject to, it is understandable that not everything can be discussed; however, it seems a great disservice to both the amount of research and work that scholars have done on the subject, and to students in academia that this research does not seem to trickle down to the undergraduate level. Ronald V. Wells states that “the appearance of this book became the rallying point for a constructive attack on both Lock and Scottish common sense thinkers who are now known as the transcendentalists” (Three Christian Transcendentalists 18). Carafiol also adds that “the whole of Marsh’s work incarnates the intellectual flux that gave rise to Transcendentalism and figures forth the profound consequences of Transcendental thought” (Transcendent Reason xiv). Marsh’s thought is that of philosophical idealism, rooted in his conservative Congregationalist background, straddling the line between orthodoxy and Romanticism. He is the figurehead of a conservative Transcendentalism that sought to preserve orthodoxy in the quest to unite the warring factions of Congregationalism and Unitarianism. Emerson, on the other hand, is the figurehead of the more liberal, and much more secularized Concord/Boston Transcendentalists, a group that formed in 1836 during the bicentennial celebration of Harvard University (Gura 50), who sought, while discussion religious and philosophical issues of their day, to, in the words of Orestes Brownson, to “democratize religion and philosophy…he walked shoulder to shoulder with other liberal Christians who derived from Romantic philosophy and religion the impetus to reinvigorate their faith and work toward a realization of more democratic ideals” (53). The space between these two groups, the book that unites them, Aids to Reflection, the book that Marsh saw as a healing force, fell victim to differing interpretations; what Marsh saw as the answer to the problems of stale orthodoxy Emerson saw as a route to a uniquely American mysticism in which man could be freed from the bonds of religion entirely because where the Puritans saw humanity as subject to God, Emerson saw humanity as gods. The unity that Marsh so desired instead served to simultaneously divide the two groups. Thus it becomes necessary to dig deeper; to look at the religious controversy of the time; and to look at Marsh’s “Preliminary Essay” on its own terms, and Coleridge’s Aids to Reflection on Coleridge’s terms in order to put the pieces together and understand Transcendentalism as a whole; thus, like Marsh’s aim to unify dissenting sects, this thesis aims to unify the study of American transcendentalism. Religion was the foundation of Transcendentalism; religious orthodoxy; and it is to this we will now turn. The unifying center of Edwards’s life was the glory of God experienced as an active, harmonious, ever unfolding source of absolutely perfect Being marked by supernal beauty and love. The dynamic activity of the Godhead, especially as manifest in the Trinity, was ever in the forefront. Against many of the optimistic opinions of his century, Edwards defended Calvinistic convictions about the lost-ness of humanity and the need for divine grace to initiate redemption. Yet with the spirit of his age, Edwards also promoted an affectational view of reality in which “the sense of the heart” (one of his favorite phrases) was foundational for thought and action alike. The cast of Edwards’s mind was relentlessly intellectual-“many theorems, that appeared hard and barren to others, were to him pleasant and fruitful fields, where his mind would expatiate with peculiar ease, profit and entertainment,” was the way his friend and student, Samuel Hopkins, put it (Ethical Writings, 401). As a result, Edwards delighted in abstruse metaphysical questions almost as much as in theological or biblical challenges. In this respect, Edwards shared much with his near contemporaries, the Catholic Nicholas Malebranche and the Anglican George Berkeley, both of whom also developed forms of theistic idealism in response to what they perceived as the philosophical drift of their age. Edwards was fascinated by the discoveries of Newton and his successors. Yet, fearing the threat of materialism in such work, he argued that the laws of science were not self-subsisting. Rather, they were products of God’s self-conscious intellectual activity. Edwards was not threatened by these discoveries because he felt they revealed the regularity, harmony, and beauty of the Divine Being. A division between the spiritual and the material was as uncongenial to Edwards’s thought as it was commonplace in the Enlightenment more generally. To Edwards, progress in science showed more about the character of God than it did about the character of the physical universe. His solution to the Newtonian challenge was a strong dose of philosophical idealism: “that which truly is the substance of all bodies is the infinitely exact and precise and perfectly stable idea in God’s mind, together with his stable will that the same shall gradually be communicated to us, and to other minds, according to certain fixed and exact established methods and laws” (Scientific and Philosophical Writings, 344). The answer came in the form of Samuel Taylor Coleridge and his odd collection of the aphorisms of English divines, mostly comprised of aphorisms of Anglican Archbishop Robert Leighton, with Coleridge’s commentary throughout entitled Aids to Reflection in the Formation of a Manly Character, on the Several Grounds of Prudence, Morality, and Religion, Illustrated by Select Passages from our Elder Divines, Especially from Archbishop Leighton. The simple, unlearned Christian, who knows only his Bible, and daily reads that with an unquestioning confidence in the more simple truths which he reads, and which he that runs may read, may well be, in some respects the envy of the puzzled though learned man of books. He goes on in the even tenor of his way, with his head at ease, and his heart unmoved, but by the feelings of penitence and love. He knows nothing of the ten thousand distracting questions, the harrowing doubts and maddening skepticism, that dry up the heart and seethe in the brain of the unfortunate student, who has ventured to pass the consecrated limit of his traditional faith, and look back upon it with the cool eye of critical investigation…no wonder they choose the upper air, and leave unruffled the abyss below…But woe to the daring and ill-starred adventurer who plunges into the metaphysic depths of controversial theology! Well may he ponder his voyage; for it is little less difficult than that of our great adversary when he passed ‘the throne/Of chaos, and his dark pavilion spread/Wide on the wasteful deep. '” (Torrey 44-45). Coleridge was no stranger to the difficulties of the spiritual inward journey either; Rime of the Ancient Mariner is the ultimate archetypal journey to the abyss within, with no clear comfort of absolution after the journey has been made. Ross Woodman, in his article “Literature and the Unconscious: Coleridge and Jung,” in The Journal of the Society of Analytical Psychology makes the observation that “the experience of letting oneself drop into the seething life below the threshold of consciousness is enacted over and over again in the work of the major Romantics” (363). He discusses this theme in terms of Wordsworth’s “awful power” of the Prelude, Shelley’s “suicidal plunge” into the fire “for which all thirst” in “Adonais,” and Coleridge’s “deep romantic chasm” of “Kubla Khan” (364). The divinity of humanity is revealed in the creative process–for Wordsworth, Keats, Shelley and Coleridge–in the creative use of words. Yet the plunge into the awful abyss is also sublime, for in the plunge is the faith in the later subjugation of the shadow side; the sublimity in the exorcism of the fear of looking into the mirror. In the Bible, Jonah is swallowed up by the whale; Shadrach, Meshach and Abednego are thrown into the fiery furnace; all come out the other side humbled, egos subjugated, praising God. Tied to redemption for all of the Romantics is how humanity interacts with the nature that humans are a part of; God’s creation without is subject to the free will of the created people of God who reside within it. Wordsworth escapes the industrialized deadness of the cities to walk amongst the living meadows in his beloved Lake District; Shelley wandered through his hauntingly beautiful Europe, Keats drank from his “fountain of immortal drink/Pouring unto us from the heaven’s brink,” in “Endymion,” and Coleridge contemplated the “supreme beauty” of Christ in terms of the nature which surrounded him in “Religious Musings.” It is only when the Mariner who has been doomed to the psychic nightmare of “Ancient Mariner” looks kindly on the sea serpent (thus sublimating ego in favor of conscience) that redemption becomes even a hope to the Mariner; those who are Dead in Life are lost forever. Yet the ego is never really sublimated, for the Mariner is doomed (or blessed) to repeat his tale over and over again in the endless tortured ecstasy of creative process. For Marsh, the act of reflection is a way to “view” scientifically and metaphysically, the activities of the soul on an external and internal level. Unlike Locke, who thinks that there are “things in themselves” we cannot know, Marsh, by comparing the human soul to a plant in order to describe the soul on a physical external level both humans and plants are affected by external circumstances: the human thirsts, the plant thirsts; plants and humans need food in order to grow. The second meaning of “soul” to Marsh is when he describes what separates the human “soul” from the plant-the plant has no knowledge of morality; it must do as it was created to do according to the laws of nature; whereas the human has the ability to make decisions contrary to nature, we have a state of consciousness about self, and we have the faculty of the will to make determinations about our life and goals. In philosophy equally as in poetry, it is the highest and most useful prerogative of genius to produce the strongest impressions of novelty, while it rescues admitted truths from the neglect caused by the very circumstances of their universal admission. Extremes meet. Truths, of all others the most awful and interesting, re too often considered as so true, that they lose all the power of truth, and lie bed-ridden in the dormitory of the soul, side by side with the most despised and exploded errors.